Today, I am going to show you the latest craze in the nail art world. It is called FIMO nail art. In the above picture, I only use top coat. However, I remove it after the photo shoot as I need to do some washing. 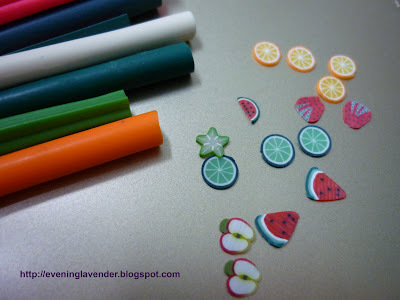 I purchased the FIMO sticks during the Malaysian Beauty Expo at Mid Valley last week. It cost RM12 for 12 sticks. I believe it is sold online. 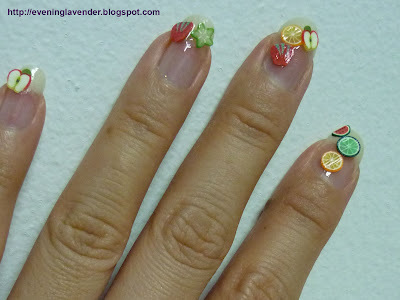 Have you seen these FIMO nail art before? Have you tried it before? Pls share. 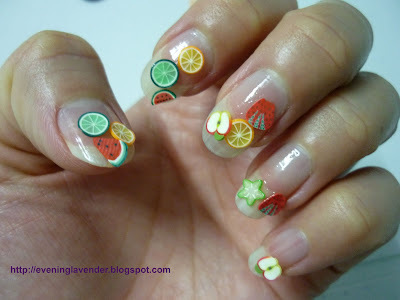 You can also click here to see my nail art designs in the archive. but sure easily drop out right? Yes must use nail glue to prevent it from dropping. Yes, u are right, I have erasers that looked like these when I was a kid. 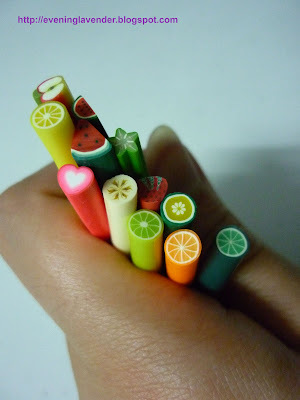 Love what you've done with the fimo sticks! I ordered myself some last night, fell in love with them after seeing some of the designs online. Hopefully when I start playing with them they'll look half as good as yours!